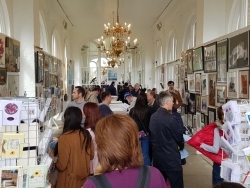 Firstly, I would like to thank the artists for making this year’s exhibition a great success. We made over £10,000 in sales and more than half of the artists sold works. Also, this year we had an increase in sculpture and ceramics which gave the exhibition both balance and variety. As always, the exhibition was beautifully curated by Alison Becket. So to all artists and Alison – a massive thank you. I would also like to thank our feature artist Małgorzata (Gosia) Łapsa-Malawska. Gosia’s artwork on the exhibition poster was a real draw-card, and she made herself available to visitors for the duration of the exhibition. Each year Isabel Langtry, Principal of Hampstead School of Art, judges our exhibition and we thank her for her time and expertise. Isabel also generously awards a prize for Applied Art: one term’s tuition in an applied art course. The artists who were awarded prizes were Elizabeta Chojak-Mysko for Artistic Excellence with her watercolour ‘Walk’; Ivan Kulinski in the three-dimensional category with his sculpture ‘King and Queen’; Kye Sook Park the Hugh Casson Prize for Drawing with ‘Melody of Love IV’; Emily Marbach for Applied Art with ‘Kensington Feathers’; and Krystyna Dankiewicz’s ‘Sunset in Holland Park’ was awarded the Spirit of Holland Park prize by the FHP trustees. A tremendous ‘well done’ to all the prize-winners, and to Isabel for her considered judgement. I was very proud of this year’s exhibition. The Orangery looked superb, and the administration all went to plan, thanks to my wife Sandra and daughter Alex (aka Alessia). As always, Rhoddy Wood was on hand to help in all areas, especially the Mini-Market, which did very well this year. Thanks also to Joy Puritz, for her compilation of the catalogue, year after year. We are also most grateful to the other trustees and the stewards for volunteering their time. This year the icing on the cake was the sponsorship of the exhibition by Ilchester Estates. The family has been a part of Holland Park and the history of Holland House for many years, being the final owners before handing it over to the Council. Their new development of Holland Green, next to the Design Museum, is breathing new life into this end of the High Street. I would like to thank Ilchester Estates for their support, which I hope will continue and grow in the years to come. As always, we had generous support from local restaurants, hotels and businesses for our raffle, the entire proceeds of which go to The Friends. Thank you again to the artists – you are the exhibition! I look forward to doing it all again next year at the 2019 Art Exhibition. The exhibition is now full and regretfully we can accept no more registrations for 2018. The Private Views are now also fully booked. 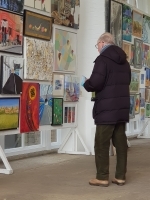 The Friends of Holland Park 2018 Art Exhibition is only a month away and I am pleased to report that our appeal to introduce new artists to the Friends is working. I am excited about this year’s Feature Artist, Małgorzata (Gosia) Łapsa-Malawska. Gosia is a Polish artist based in London. She works mainly in painting as well as in collage, photography, poster design and lithography. Gosia has received several awards, had many solo shows and exhibitions as well as exhibiting with the Friends for the past five years. She is involved in several local community projects. Could all artists please ensure that their Exhibition details forms are with me by Friday, 16 March. Please remember to indicate which Private View you would like to attend: Friday night or Saturday morning, otherwise you will not receive tickets. We hope you will support The Friends of Holland Park by visiting our exhibition and tell all your family, friends and neighbours. Look forward to seeing you there.